quarrygirl.com » Blog Archive » madeleine bistro closing for the fall. get it while ya can! 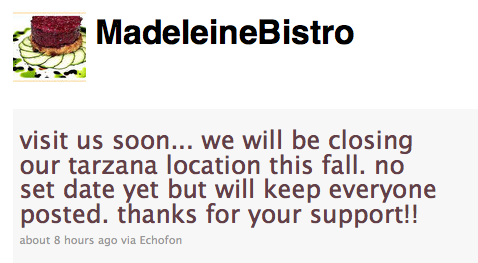 madeleine bistro closing for the fall. get it while ya can! in a constant attempt to keep you updated on the ever-changing situation of one of LA’s best vegan restaurants, madeleine bistro, i’m bringing you some news that they posted on facebook and twitter yesterday. apparently, they are closing for the fall. so act fast, and go eat there. last time we posted on the tarzana restaurant, we told you that they were temporarily closed for brunch, and only open friday – sunday night. well that’s changed as well. madeleine bistro is now open for brunch on sundays only (10am – 3pm) and for dinner on friday, saturday, and sunday (5pm – 9pm). i’m not sure how long this will last, as they say, they are closing for the fall….so if you have a hankering for chef dave’s food, you should get on it. make a reservation to visit us soon… we will be closing our tarzana location for renovations and expansion plan this fall.. stay tuned for exact date and details… thanks for your support!! expansion plan?!?! sounds good to me. not sure if this is the new rumored location in eagle rock, but i sure hope so. so that’s all i know at the moment. brunch is back, sunday only. they will be closing for fall, but hopefully not for long. i will keep you guys updated as i hear more info, but everyone should follow madeleine bistro on twitter and friend them on facebook for the latest news. oh, and by the way, i have been looking for an excuse to show you this new breakfast sandwich that just got added to madeleine’s brunch menu. it’s so good! 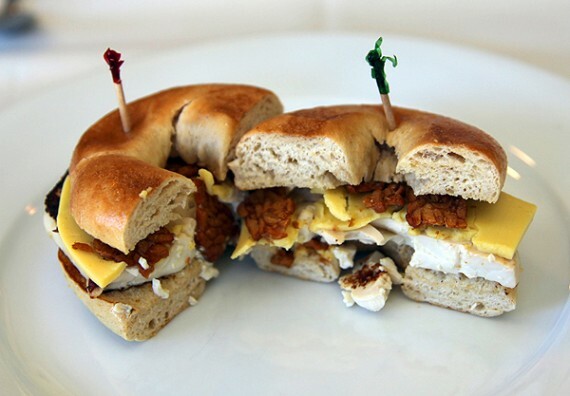 a bagel mcmuffin thingy with vegan cheese, tofu, and tempeh bacon. nommers. My friend ate there recently and a server confirmed they are “moving to Eagle Rock.” I asked if it was a MOVE or if they were opening a new location, and my friend did not receive clarification on that point from the server. But either way – I would love to see them in Eagle Rock!! Seriously, I love their food but all this crap about opening at random times, switching up the menu etc. is getting old. Is Chef Dave getting bored of making the same stuff? Probably. But closing for dinner and the brunch is inexcusable. How can such great food artists be such bad restaurant operators and businesspeople? Woah, that bagel made my eyebrows fall off. It looks good enough to pet and then eat it. I want. @tremens I think it’s unfair to say they’re bad businesspeople. Remember, it’s just the two of them doing all of this and it’s incredibly hard to run a restaurant. Granted, closing down randomly and having weird hours here and there isn’t the best way to do things, but doing all this in addition to their meal delivery service (and raising kids!) has got to be a lot to deal with. Oh cool!! I’m close to ER and that would be so great if they moved there!! I seriously love their food, but I too am really tired of all the rigamarole when it comes to their hours and menu. It’s a long drive for us, and there’s not much else to attract us to that area, so after our last couple of visits when various menu items weren’t available, or our group order of waffles and “chicken” overwhelmed their single waffle iron, we don’t bother any more. And it’s a shame because, yes, their food is awesome. If they were any other restaurant, all this nonsense would be completely unacceptable. It’s a testament to how good their food is, that I even hope that the Eagle Rock rumors are true. I hope that after the fall, they get their act together in a way that’s manageable for them. I don’t mind a small menu and small hours, but it’s got to be reliable. c’moon eagle rock!!! the only reason i’ve never been to mb is because it’s so damn far from me and anyone who knows me will tell you: i *hate* long car rides. Hmm…their Twitter page says, “We will be closing our Tarzana location this fall.” Not “for the fall” as Quarrygirl says more than once in her post. I’m confused…? @KD: i could have interpreted it wrong! from what it said on their facebook, it sounded like they were re-opening! aaaaah i hope so. WORD, tremens. I love MB but really? It’s getting ridiculous – and wearing very thin. Anyway we were assured that the Tarzana location would stay open, but I don’t believe it for a hot minute. Or maybe it was true two weeks ago but they’ve changed their minds again.